Welcome back to the Expert Resurfacing blog! In our first blog post, we introduced you to some of our resurfacing services, including tub resurfacing, shower resurfacing, and tile refinishing. Resurfacing is an excellent way to improve the look and feel of each of these surfaces, but there are many more benefits to refinishing different surfaces throughout the home. Vanities are one of the most crucial elements of any bathroom, and one that lacks style, cleanliness, and function is not only unattractive to look at, but may also be difficult to use to its maximum capacity. 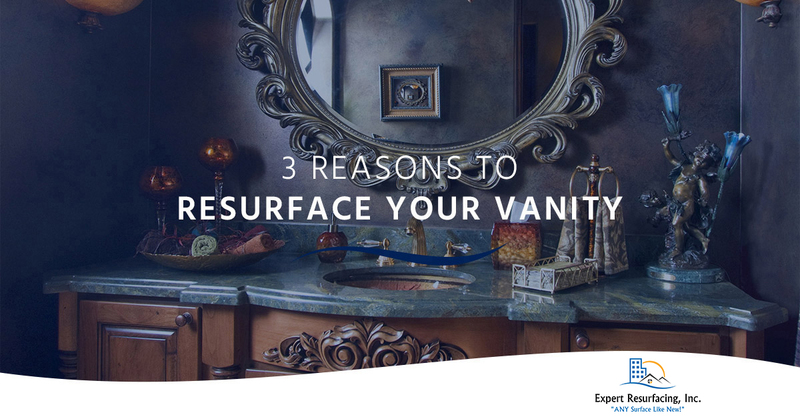 Today, let’s explore some of the reasons why vanity resurfacing can improve the aesthetics and function of any bathroom. Maybe when you moved into your mid-century modern home, the baby blue vanity worked at the time, but has since become out of date. While undergoing a full-bathroom makeover may not fit into your immediate budget, changing the color and style does. Vanity resurfacing is a cost-effective way to rejuvenate the existing countertops in your bathroom to give them a new look that matches your style. Applying a new finish over the existing countertops can completely transform a bathroom from drab to exquisite. For those who want to make small improvements over time, resurfacing a vanity leaves funds for buying new paint for the walls, upgrading bathroom fixtures, and decorating. Bathroom vanities in secondary bathrooms in the home are sometimes in worse shape than those in master and main floor bathrooms. Sometimes, bathroom vanities have become damaged as a result of wear and tear, especially in older homes. Additionally, kids, pets, and previous tenants may have caused damage to a vanity. By resurfacing a vanity, homeowners can restore the look and function of vanity countertops at an affordable cost. Because these spaces are used daily, it’s important that they provide smooth, flat surfaces which are free of dents, chips, and stains. Resurfacing is a great option for those who want to restore the existing countertops so they look nice and provide usable space free of damage and hazards. 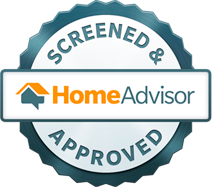 For those looking to list their home on the competitive housing market here in Chesapeake, it’s crucial that all the main elements of the home look good and appeal to potential buyers. While budgets are usually tight during the selling process, every penny counts and should be used in the most efficient, cost-effective manner. While a full bathroom remodel may be out of the question, you can improve your home’s resale value by resurfacing vanities that are out of date or feature an unattractive color and style that may deter possible buyers from putting in an offer. There are so many benefits to be gained from resurfacing vanities. If you would like to reinvent your bathroom vanity, contact Expert Resurfacing, Chesapeake’s Top Rated Local® resurfacing company. We can restore any surface to improve its appearance and function, and would happy to provide residents in and around the Chesapeake Bay with a free estimate. Call us today to get started on a vanity resurfacing project!